It's been at least a decade since I've worn a pair of flared jeans. That was all anyone wore back then, but now we are super spoiled for choice with so many different cuts of denim in vogue. The cool thing about today's flares is that they tend to be cut a few inches longer so that they can be worn with heels for a more polished, figure-elongating effect. While this poses a bit more of a fit and style challenge, the overall effect is much more chic than the boot-cut jeans of yesteryear. Thankfully Banana Republic carries the majority of its denim styles in petite sizes as well, but even then you can see that there is no way I'd be able to wear these jeans with flats unless I wanted the hems dragging everywhere (and at 5'4", I barely qualify into the petite category). A pair of heels is definitely requisite when it comes to wearing today's flares. Nevertheless, despite the more polished vibe of flared pants these days, I still dig the more free-spirited stylings of the original bell-bottom jeans circa the 1970s. I wouldn't go so far as to wear them with a furry coat and some round John Lennon-style sunglasses, but I styled them with my flowingest, most bohemian blouse from Free People and a tan fedora for that vaguely Penny Lane vibe. 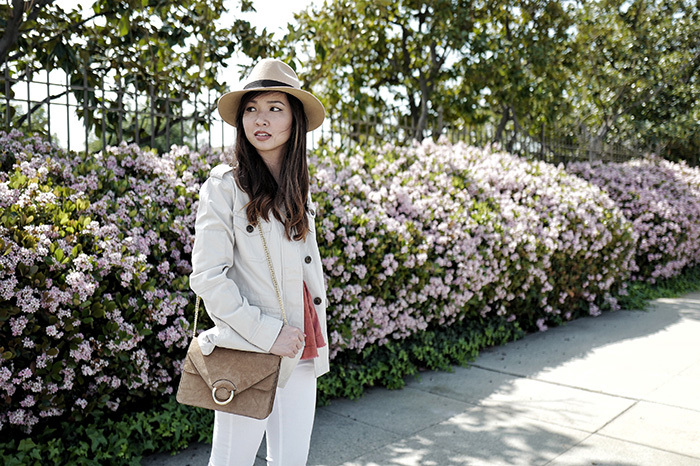 Paired with a beige safari jacket, the overall color palette of muted tans and a soft warm coral is a super pretty combination for spring. 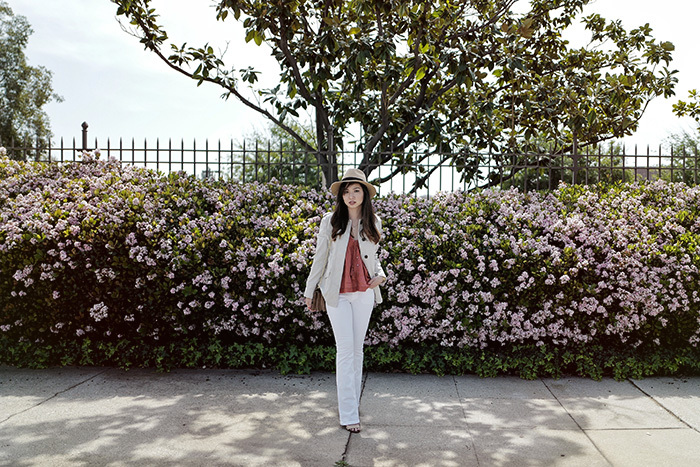 White flared jeans, c/o Banana Republic. Stone military jacket, c/o Banana Republic. Doin' It Right blouse, Free People. Tan fedora hat, Prima Donna. Suede accordion crossbody bag, Banana Republic. Tan and black sandals, Foreign Exchange. Beautiful outfit! Your blog have the most beautiful design ever! You look awesome! I love that flares are coming back into fashion. Also I love the photos with the flowers. They're so pretty! So gorgeous! I love that top and the jacket! You looks so pretty in all your outfits dear. Thank goodness for petite sizes! Those white flared jeans look great on you Tania! I really love that you styled this outfit to look more laid back and bohemian. That Free People blouse is such a pretty color. Love everything about your outfit - especially the pants! I love the look of white flares with heels! So happy that trend is coming back! I see you're whipping out the white for the arrival of Spring! I'm loving it! These photos are GORGEOUS! 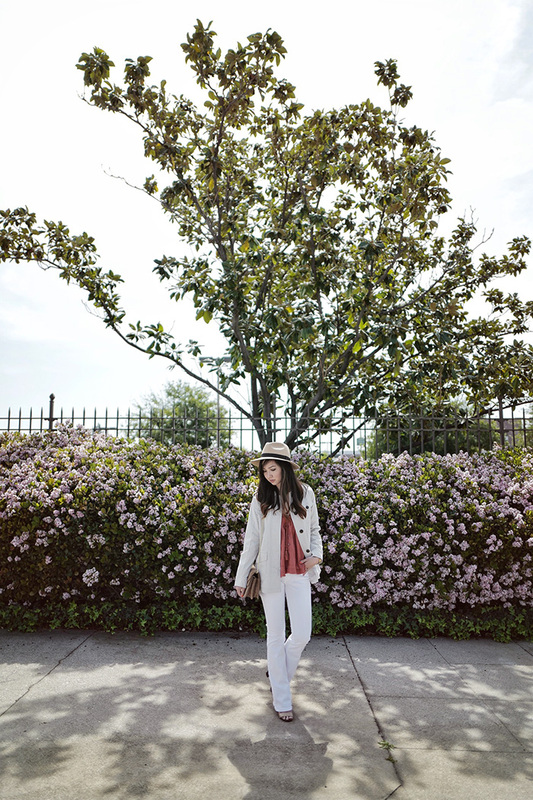 I love your outfit and how you layered the perfect style for spring! Wow love that top so much so boho, but I love the way you styled it with that flared jeans, and yup I'm the same the flare jeans I have are from way long long time ago haha .xoxo BING. You are rocking these flares, Tania! They have been my favorite silhouette for denim lately as well. This is just the perfect spring outfit! I love the outfits! You're beautiful! Head to toe fabulous! Love this look doll. You look so adorable! Have a wonderful day! Such a fabulous look! And I love that bag too. I love how the coral breaks up the white tones, and the fedora is perfect! Stunning outfit and shoot!